CAT 2018 exam is scheduled to be held on 25th November 2018 in two sessions – forenoon and afternoon. The CAT 2018 registration number has exceeded the number of candidates of 2.41 lakh with an increase of 10000 candidates compared to last year. The CAT analysis for the last eight years reveals that this year CAT registration is the highest since 2010. The registration and application process for CAT 2018 was closed at 11:59 on 26 September 2018 after a 7-day extension from 19 to 26 September. This implies that more than 2.41 lakh applicants have finally applied for admission to MBA 2019-21 in 20 IIM and other top B schools accepting CAT 2018 scores. 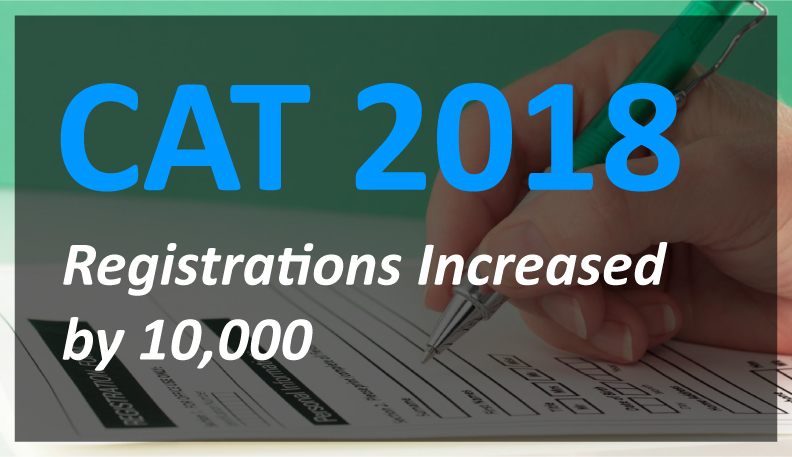 This year, the CAT registration number as revealed by CAT 2018 exam convener shares the number of applicants who completed, submitted and paid their registration fees. In the last few years of the CAT, only the registration number has been released without any clear distinction between the number of candidates who paid or unpaid CAT registration fees. CAT 2018 exam has now broken past 8 years record with yet higher number of applicants registered for the exam. The high number of CAT registrations and applications has had its ups and downs in recent years. However, since 2014, CAT has seen an upward trend in listings.As we can analyze that trends in CAT registrations since 2010 show a downward journey but from 2013 it has been showing a rising registration count reflecting the regaining trust of CAT aspirants and anticipation of better career opportunities after completing MBA/PGP from an IIM or other good B-school. Now indeed Commerce is the option of a big community. Many students go through with commerce stream, who wants to work with in a corporate world.